Home Numerology Angel Number Meanings Quadruple Digit Angel Numbers Meanings Angel Number 1221 Meanings – Why Are You Seeing 1221? Some days seem full of serendipity. It starts when you buy your normal coffee and bagel, but your favourite café has changed their prices and your total unexpectedly comes to $12.21. When you arrive at work you receive a new password for an important system, it contains the digits 1221. A late morning meeting over runs. You look at the time as you exit and see that it is 12.21pm. During the lunch break you buy a lucky dip lottery ticket. You first two numbers are 12 and 21. Why are you seeing this number everywhere you turn? Most likely, you are being sent a message from the Angels. What could the quadruple digit Angel Number 1221 be trying to tell you? What does Angel Number 1221 mean for love? Angel Number 1221 has two 2s at its core, which also form the Master Number 22, surrounded by the number 1. The number 2 represents duality in all its aspects: within the different parts of ourselves, within relationships, and the duality of balance as what goes up must come down. It is suggestive of compromise and harmony. The number 1 in contrast is a symbol of singular ambition. It represents our ability to shape our lives as we wish through strength of will and our actions. The Master Number 22 is an extension of these ideas, and represents the master builder, who is fully in control of every aspect of their world. 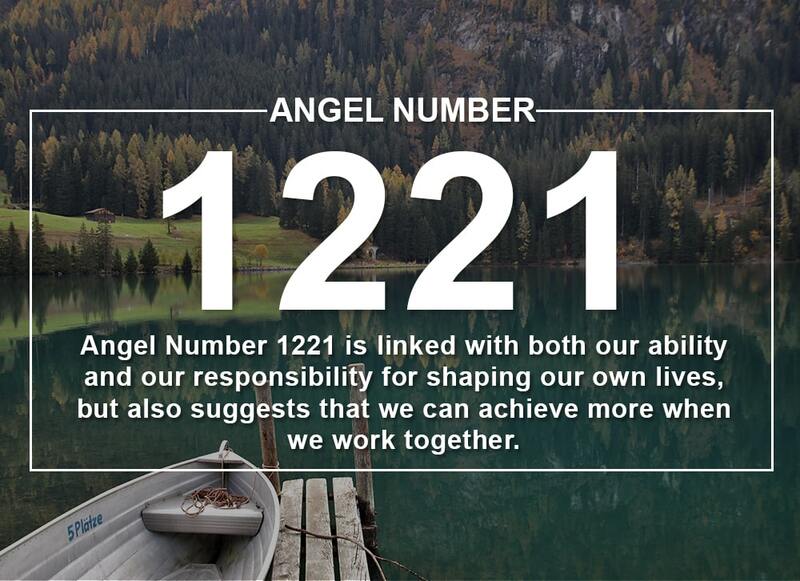 Angel Number 1221 is linked with both our ability and our responsibility for shaping our own lives, but also suggests that we can achieve more when we work together. This saying actually comes from none other than Dolly Parton. Love her or hate her, you have to respect how she decided what she wanted from life, and she made it happen. But her words suggest that it is not hard work alone that will bring success. You need to know what you want the end result to be. If you feel like you are working hard, but you are not moving forward, this can be because you have not set a clear direction. You cannot move towards something if you do not know where you are going. Angel Number 1221 can show up to tell you that it is time to develop a clearer vision of what you want. Once you have this, you will start to find that all your hard work will pay off. In contrast, sometimes we know exactly what we want, but we still struggle to achieve it. Perhaps we suffer a series of setbacks, which we are tempted to blame on other people, or just back luck. Angel Number 1221 can be a sign that what we are actually missing is a true commitment. We want to save up for something, but we aren’t willing to give up expensive habits. We want to study for a new career, but we still spend our evenings in front of the TV instead of in front of the books. The 1221 Angel Number tells us that if we truly want something, we need to commit to it 100 percent. This can often mean making sacrifices, which may seem difficult at the time, but which we will be grateful for in the long run. Sometimes we are reluctant to accept help. Perhaps we do not think that the person offering can do what they say. Maybe we do not want to feel indebted to someone else. Other times we think that this is ‘our thing’ and we need to do it all on our own. Angel Number 1221 can appear to say that the offer of help on the table is a good one. Not only will it help us get what it is that we want, but it could strengthen our relationship with this other person. We may find a new connection that has a profound influence on our lives. We all have ambitions, to be healthy, to be diligent, to be kind. It can be hard to live up to our aspirations for ourselves. Sometimes this is made harder by the people that we surround ourselves by. Research shows that we are highly influenced by the people around us, and that negative influence is stronger that positive. For example, in a group trying to get fit, the laziest person in the group drags down achievement more than the most diligent person in the group pulls it up. It is clear how important it is to dispel negative influences from our lives, that might encourage us to follow our worst instincts, and surround ourselves with people who will encourage us to be our best selves. Angel Number 1221 suggests that we should look at who we are surrounded by and what influence they are having on us. Just as we are responsible for shaping our lives, so is every person. This is why you can never change another person, and they must change themselves. This is also why when you give someone an opportunity on a platter, they can fail to live up to it. This opportunity has been envisaged by you, and they need to envisage their own. 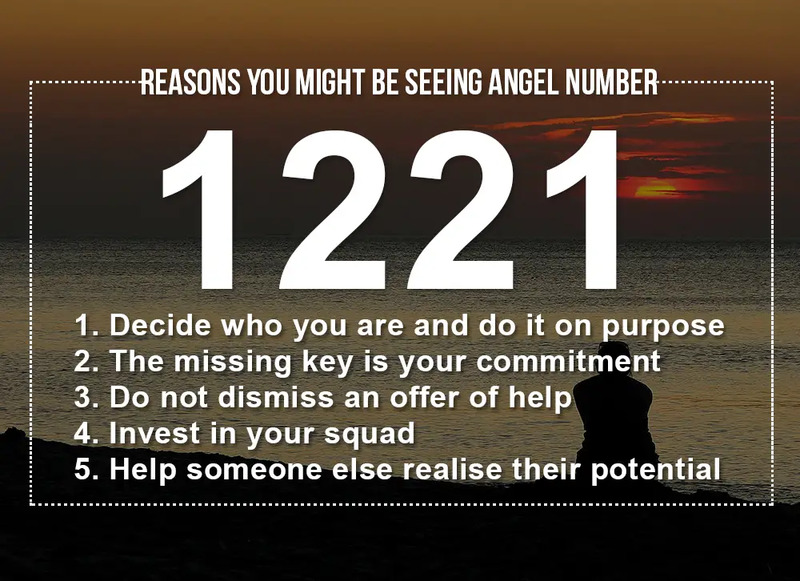 The 1221 Angel Number can be sent to us when you are worried about someone in your life who is struggling. It suggests that it will be counter productive to give them the answers, or do things for them. But, if you can help them find their own power and self-belief, you can help them transform their lives. When it comes to love, Angel Number 1221 is a reminder that a relationship is a coming together of two individuals to create something that is more than the sum of its parts. But within a relationship, both individuals are important, and need independence and their own path and strength. Sometimes Angel Number 1221 suggests that a relationship is unbalanced. Perhaps one person is making too many sacrifices to support the ambitions of the other, and their own dreams are beginning to fade away. Or perhaps one person is carrying the other, seemingly helping them, but in fact draining them of their ability to help themselves. 1221 suggests that a new balance needs to be struck. When Angel number 1221 shows up, it usually means that now is the time for action, and that you have the power to actively improve a situation. To know where and how to focus your energy, take note of what you were doing or thinking when the Angel Number appeared. Angels will reveal their messages within the context of the challenge or situation that they relate to. They will show you their message at a time that gives you the clues you need to understand them. Do you seek guidance and insights into the past, present and future, with regards to relationships, love, or money? If you are frequently seeing the 1221 Angel Number, take this popular free test to see whether your Guardian Angel is trying to send you an urgent message. Keep seeing 1221 everywhere? When Angel number 1221 shows up, it usually means that now is the time for action. Learn the important meanings today!